Dates and cost: 29 August, 2019 - 5 October, 2019. Or 30 August, 2020 - 6 October, 2020. 38 days in Nepal. 38 days in Nepal. 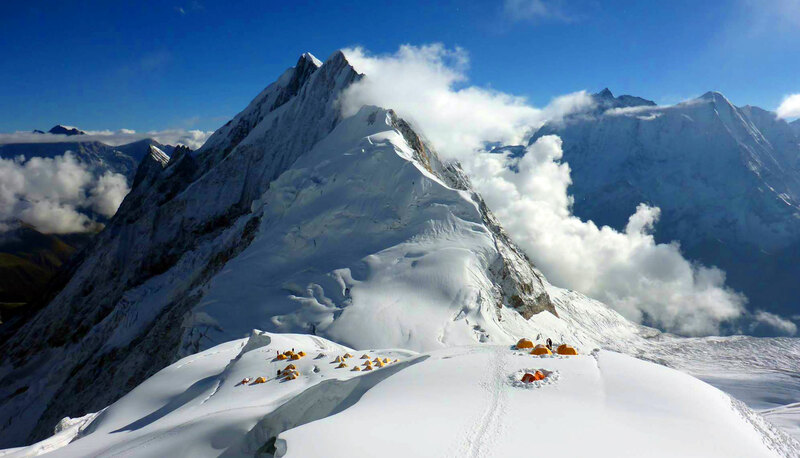 At 8,156 metres (26,759 feet), Manaslu is the eighth highest mountain in the world. It is located in the Mansiri Himal section of the Himalayas, in the west-central part of Nepal. Its name, which means "Mountain of the Spirit", comes from the Sanskrit word Manaslu, meaning "intellect" or "soul". Manaslu is the most accessible 8,000 meter peek in Nepal and is one of the easier 8,000 meter peaks. Join us on a unique climb that is off the beaten path. Two nights stay in a Kathmandu hotel on arrival and two nights prior to departure in a double room. Private rooms are available for a small additional fee. Private Sherpa (personal guide/porter) – Carries up to 10 kg (22bs) of your personal equipment, climbs with you, melts water, cooks, and will be with you every step of the way. We recommend a three bottle set for Manaslu. The price includes three large 4 litre Russian Oxygen bottles, mask, regulator, hoses, as well as carriage to the high camps by porters. Extra bottles are available for an additional fee. We have a 30% buy-back policy on masks, regulators, and unused oxygen bottles in good condition. Mask and Hoses which are guaranteed to be in proper working order and match the bottles and regulator. 1. Arrive Kathmandu, 1,300 meter (4,265 feet.) Stay at hotel. 2. Orientation, training, and equipment review at hotel in Kathmandu, last minute shopping, group dinner. Stay at hotel. 7. Rest in Bimthang, short acclimatization hike. Stay in tea house. 8. Hike 9-11 hours toSamdo3,860 meters (12,644 feet) via Larkya-La Pass 5,160 meters (16,929 feet). Stay at tea house. 11. Hike 6-7 hours to base camp, 4,800 meters (15,748ft). 12. Rest in basecamp. Acclimatization, training, and organization. 13. Rest in basecamp. Acclimatization, training, and organization. 16. Walk to camp 1 and sleep there. 17. Walk to Camp 2. Return to base camp. 18. Rest in base camp. 19. Rest in base camp. 20. Walk to camp 1 and sleep there. 21. Walk to camp 2 and sleep there. 22. Walk to camp 3. Return to base camp. 23. Rest in base camp. 24. Rest in base camp. 25. Rest in base camp. 26. Walk to camp 1 and sleep there. 27. Walk to camp 2 and sleep there. 28. Walk to camp 3 and sleep there. 31. Summit attempt, descend to camp 2. 32. Pack and prepare to depart. Trek to SamaGoan. 33. Trek to Bimthang. Stay at tea house. 34. Trek to Dharapani. Stay at tea house. 35. Drive to BesiShar. Stay at tea house. 38. Say Good-bye to your new friends and depart for home. An additional down sleeping bag for basecamp for the following climbs: Everest, Lhotse, AmaDablam, Manaslu, Cho Oyu, Shishapangma, Broad Peak, K2, Gasherbrum I and II, Spantik, K2/Broad Peak Everest training climb. For Mastagata a second sleeping bag is optional, but highly recommended. Small personal first-aid kit. (Simple and Light) Aspirin, first-aid tape, plasters (band-aids), personal medications, etc. 10 Stomach antibiotics: Ciprofloxacin, etc. Paperback books, playing cards, ipod/mp3 player, musical instruments, extra batteries, etc. We provide group gear, equipment, and supplies including: rope, ice, rock, and snow anchor protection, tents; stoves, fuel, walkie-talkie radios, bamboo marker wands, etcetera. A personal tent will be provided for each member at base camp. On the upper mountain, team members will share tents. In base camp, a shower, toilet, solar charger, and a dining tent will be provided. Leadership: Dan Mazur is a relaxed, friendly, well organised, and highly skilled professional with over 20 years of experience leading people to the summits of Everest, K2, Broad Peak, Gasherbrum, Cho Oyu, Lhotse, Manaslu, and Shishapangma. With expedition leaders Dani Fullier and Don Wargowsky you will have an excellent experience on Manaslu. Sherpas: We employ some of Nepal, Tibet, and the Karakorum’s best local mountaineers and Sherpas to assist team members in realizing their summit goals. Our friendly and loyal high altitude climbing staff has supported teams to the summits of more than ten of the highest peaks in the Himalaya. Winter snow walking experience and experience at high altitude is highly recommended. The trip includes brief climbing clinics. We will teach you everything you need to know on glacier near basecamp. To be successful, proper conditioning is critical to your success on Manaslu. Team members are expected to be very fit and in good health. Proper training with a focus on long hikes carrying a backpack is essential. Please fill out an application and return it to us with your refundable ten-percent deposit to hold your place on the team. Proof of travel, accident, and repatriation insurance. We strongly recommend Global Rescue, with at least $50,000 worth of helicopter rescue insurance. Really good to hear from you. I've been wondering how you've been doing! Yes, I recommended my friend to climb Cho Oyu with you because I think you're an absolutely great guide. To be honest.. I've been regretting booking for Everest with the expensive company so early on last year that now I can't change my booking or even have my money back! :( I really wish I had booked with you, because I know exactly how you operate, and I really don't like the expensive company's Military Precision climbing style at all. I guess we'll see how it goes, but if I find their style too suffocating I might move to your team on the mountain. Plus, the expensive company's summit 'prediction' date is May 18th and I will be flying out of Kathmandu by May 25th, which I find a little early for a summit bid. Anyhow, I hope you are doing fantastic, happy as always, and enjoying the laid back fun-style climb! I'll speak to my friend about the Cho Oyu climb, it'll be awesome if he joins your team.